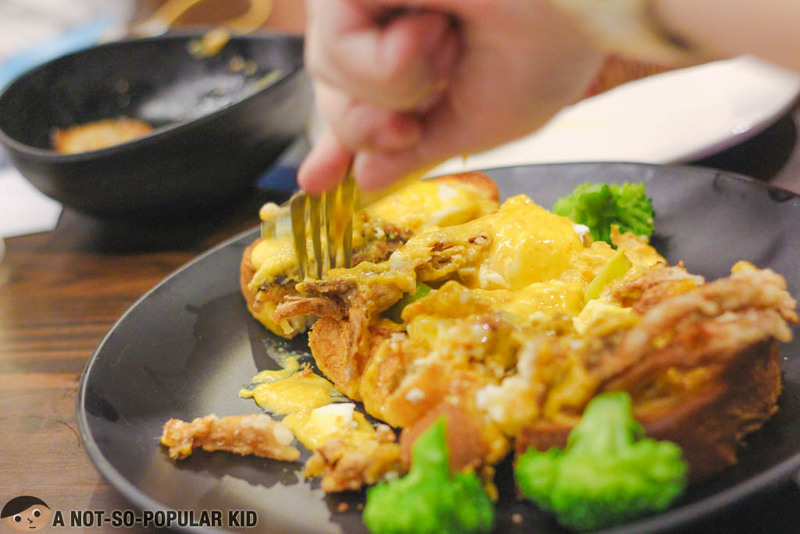 Over the years, Poblacion has become more popular as a food hub in Makati -- nestling a handful of exciting and out-of-the box dining ideas. It started to be known as a chill place, where you can have drinks over chit-chats with your friends on a Friday night. Today, while it still has that kind of element (which I think is its "defining" character), Poblacion started to evolve into something more robust. Now, it is a growing community of its own ready for you to explore and start the hunt for culinary treasures. Now, to add more variety to this exciting food hub, U Hotels just opened up its doors just this 2018. We now have a very hipster place to stay at when we just feel like "cacooning" ourselves to recharge. While I have yet to explore the hotel itself, fellow bloggers shared with me how simple yet captivating each room is here in U Hotels. One room has a unique design or theme which keeps things a "personalized", in a way. I arrived about 3 hours earlier than the rest of my KTG friends, except those who were staying in the hotel, of course. Hence, what I did was to just sit back and enjoy a cup of tea. I also started to look around, and I realized how comforting the ambiance is. It felt home -- a sanctuary. It was also raining at that time, and I sat by the window to draft some of my blog posts. Peaceful. Everything seemed slow, and I really appreciated how I was able to take a break. At last, I had the moment to internalize and think things over. This was the kind of comfort I felt here in the lounge, which by the way happens to be the "restaurant" as well. Soon enough my KTG friends started arriving together with the other guests. Chef Table is going to be an occasional event here in U Hotels wherein chefs are invited to showcase their latest culinary creations. It's basically a celebration of flavors, and guests/diners are in for something "new". Since Chef Gokioco was the presenting chef for this night, most of the dishes served are actually preview of the upcoming line-up of amazing dishes here in U Hotels. 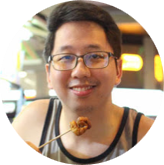 One thing's for sure, he is constantly cooking up something new and brews innovation to delight our ever-adventurous taste buds. The first dish showcased was Laing sa Chicharon. 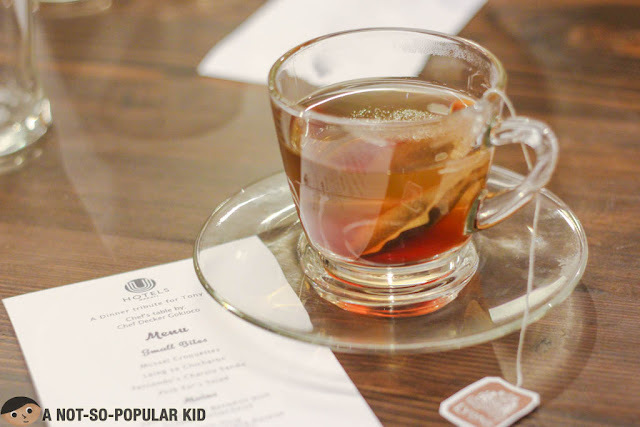 Though sinful as it looks, it definitely had a lot to offer for our taste buds. 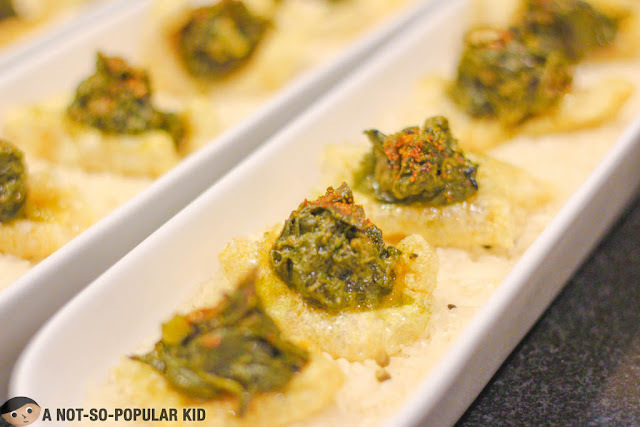 The laing had this bold creamy gata reinforced by the fatty flavors from the chicharon. Chef Gokioco also draws inspiration from other cuisines as he presented this "surprise dish" for the night. 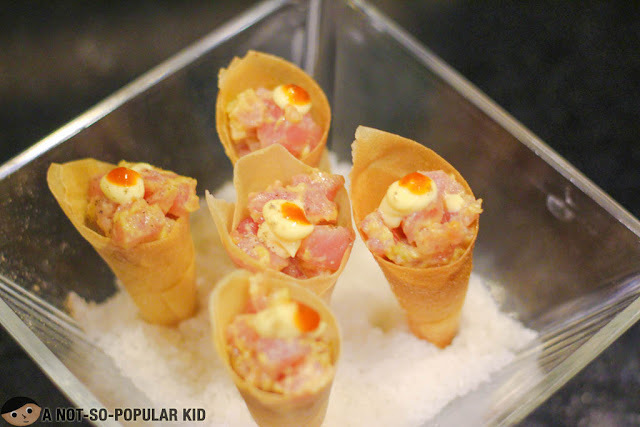 I honestly forgot how this dish is called, but it mixes raw tuna with creamy mayo mixed with crab fat and wrapped around a crisp cone. I loved how this dish oozed with flavor as it cracked open inside my mouth. 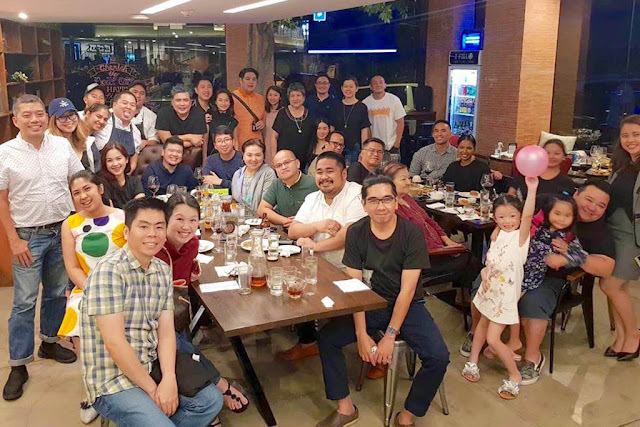 More and more dishes were revealed throughout the night, together with the stories and family-inspirations where the culinary inventions were drawn from. 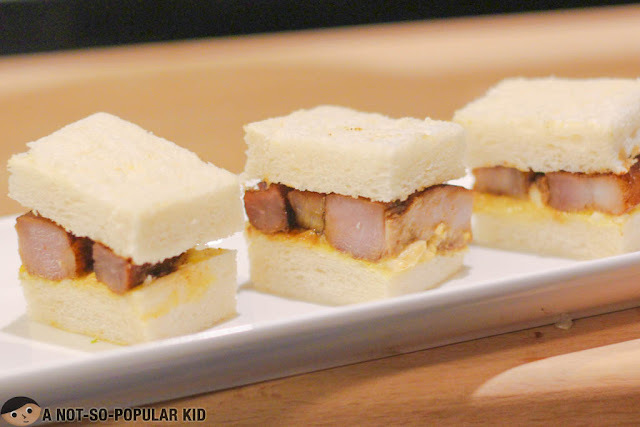 This Fernando Charsiu Sando (Sandwich) was named after Chef Gokioco's dad, who hold the original recipe of this delightful bite-sized snacks! 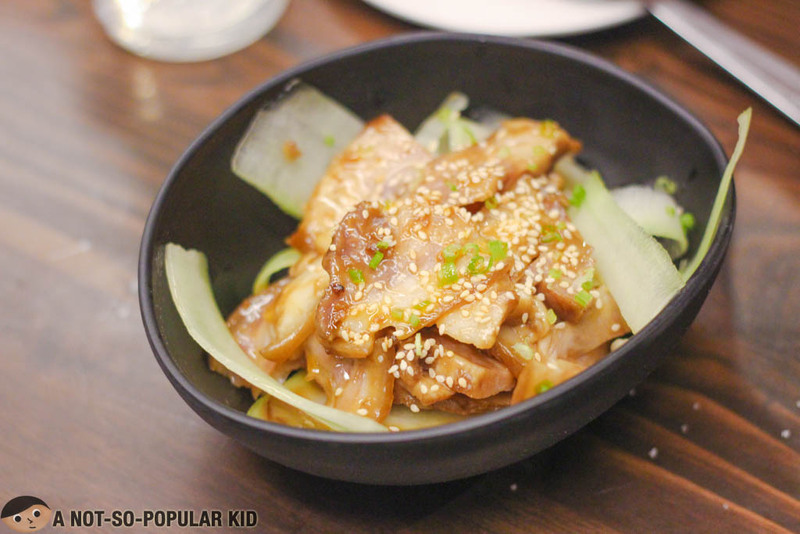 Fresher concepts were introduced such as this Pork Ear's Salad which was surprisingly good. I felt hesitant as first ,but the adventurous foodie in me urged me to give it a try. Indeed, it was refreshing as it was a first for my palate to experience such savory flavor with a playful "chewy" texture. Let's back track a little bit into the moment before we started this fiesta. 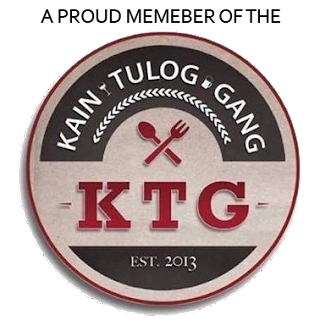 Right before we indulged ourselves with excellent food, we were given a teaser by showing an episode of LET'S EAT (Season 2) hosted by Mr. Spanky Enriquez, founder of the KTG group which I humbly belong to. 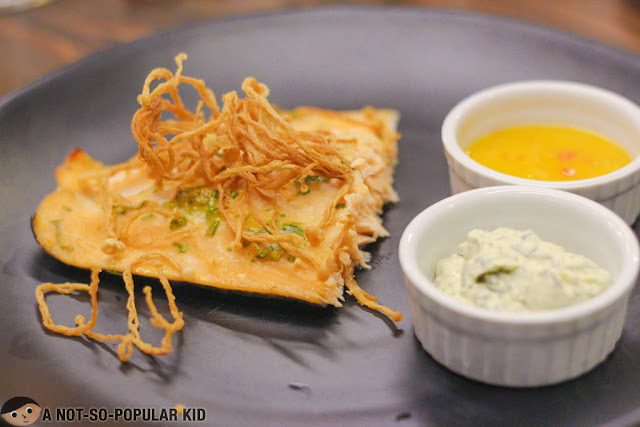 In that video, there was this particular dish which got us all drooling over as we watched the show. 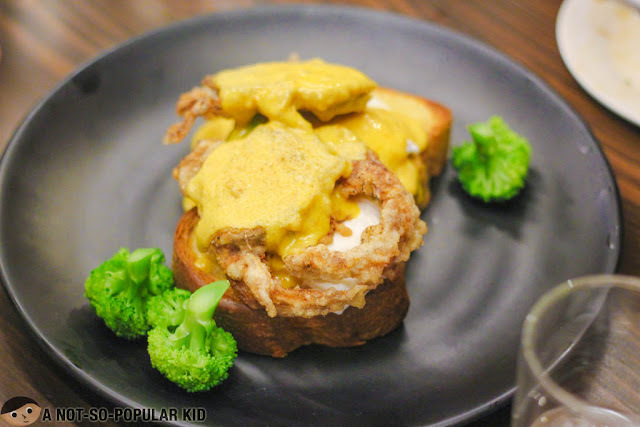 It was this indulgent creation by Chef Gokioco called "Soft Shell Crab Benedict with Crabfat Hollandaise". Man, I was really holding onto my seat seeing the sauce drip. Now, fast forward, I got all fidgety when that dish finally made its way on our table. Holy mother of food! It was breathtaking. All glorious with its vibrant colors and layering -- a masterpiece! Chef Sharwin did the honor of slicing the Benedict, as we were all trying to contain ourselves as we watched. When it was done, I let myself dive into it, and plunge a piece into my mouth. Damn! It was so goooood. Flavor after flavor came down gripping my buds. The richness of seafood essence from the crab, and the hollandaise infused with crab fat really had my world going in an instant slow motion. No kidding. It was that good. Luckily, this dish is available already here in U Hotels, so I really urge you to give this marvel a try. After the Benedict, everything else started to become more indulgent. 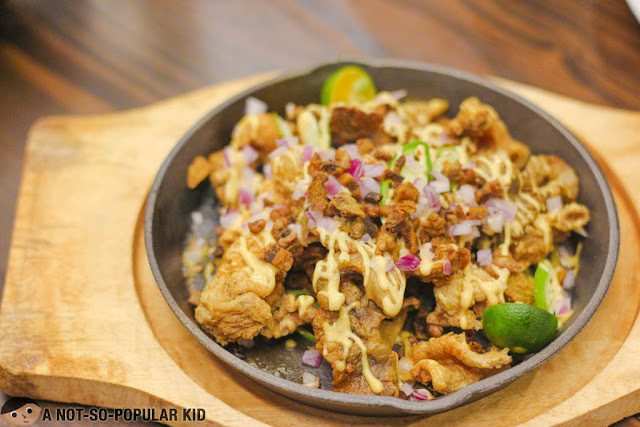 We had this Bypass Sisig which combines another two of our favorite pulutan/chibog -- Chicharong Bulaklak and Chicken Skin. Both of which gave the sisig more crunch and sinfully good flavors! 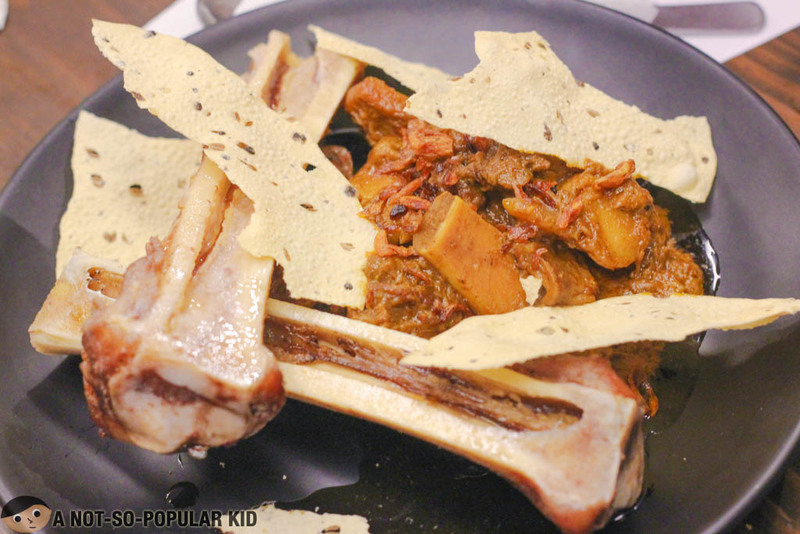 Innovation didn't stop there, as Chef Gokioco dropped another bomb with this Beef Shortribs Kulma with Roasted Bone Marrow. The beef was tender from hours of simmering, which also made the meat fibers absorb the flavors of the curry-based sauce. Take a leap of faith as you scoop the sinful creamy marrow and blend it with the beef. The combination will put your buds into overdrive. We are down to the last 2 of the main dishes presented. 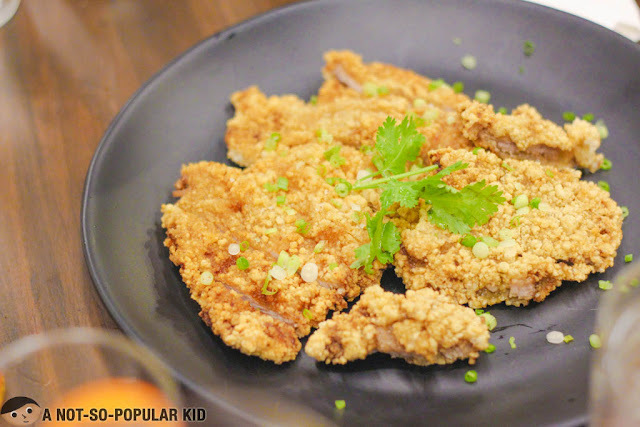 Inspired by the recipe of Chef Gokioco's mom, this dish called Mommy's Pork Chop had a crunchy, savory and subtly sweet goodness that had the comfort of a mother's touch. To tone down a bit the sinfulness of the dishes, Chef Decker Gokioco finished off its main course with this Miso Salmon with Golden Mushrooms Served with Mango Chili and Nori Aioli. It was a great finale as the meat was rightly cooked, evidenced by its tenderness and melt-in-your mouth texture. We had a few minutes to let our digestive system do its part before the desserts started "rolling" out. First one up was Sizzling Cheeserolls ala Mode which was a fantastic blend of Filipino classic desserts. 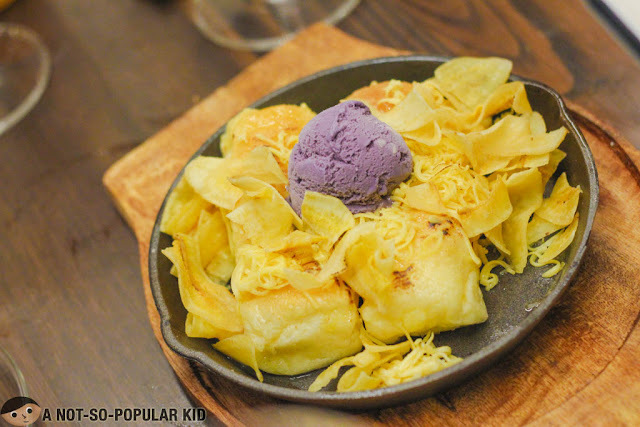 The combination of the saltiness of the cheese together with the sweetness of the Ube ice cream created a blend of exciting new flavors. 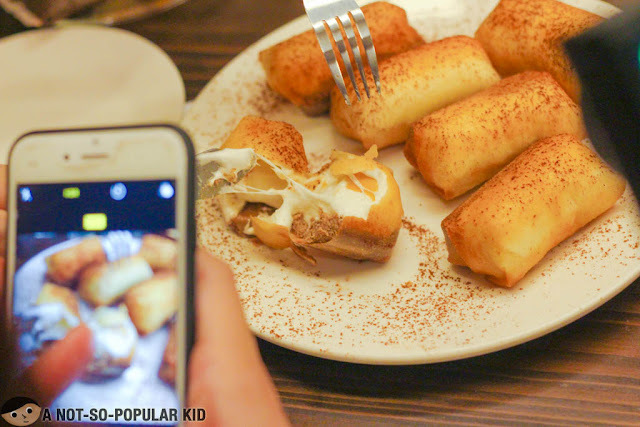 The Chocnut Smores Lumpia breaks my rule for desserts. Normally, I don't like munching on fried desserts -- for me it's contradictory. Before this, I just had one exception, and that is "Wicked Oreos". But after tasting this new creation of Chef Gokioco, I have another dish added up to my exception list. 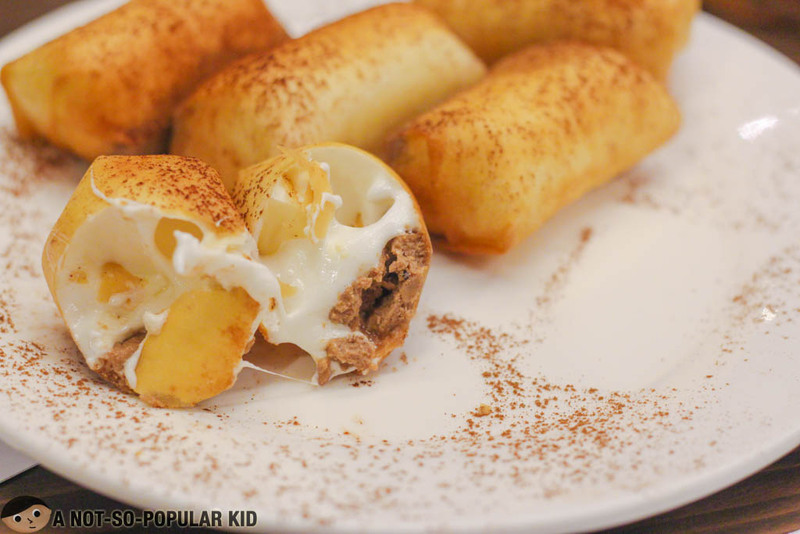 Once you crack open the lumpia, a sticky sweet goo flows out which fantastically blends with the chocnut in its core. Warning, this can be addicting to those with prominent sweet tooth. The rest of the evening was spent reminiscing more memories about Bourdain, and of course basking ourselves with the warm fellowship of friends and family. 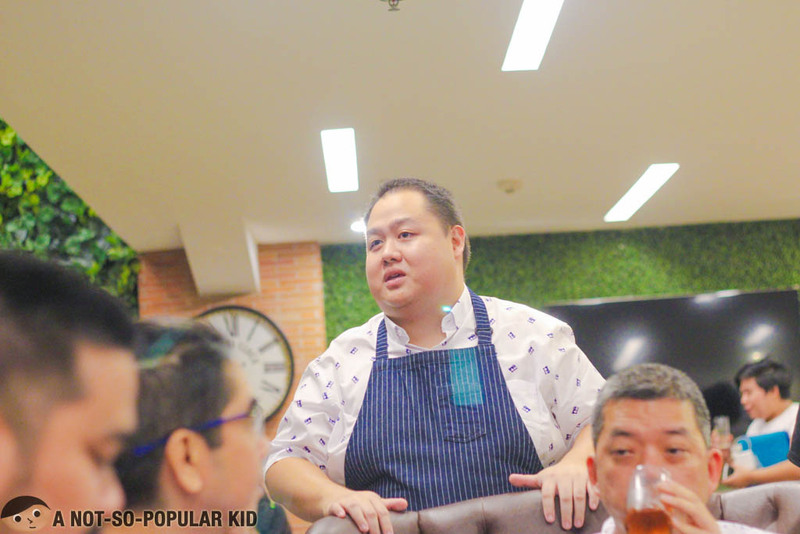 Now that practically ends up the post, and everyone really had a great time savoring all the latest creation of Chef Gokioco. TCongratulations to Chef and the owner of U Hotels for this amazing feast! 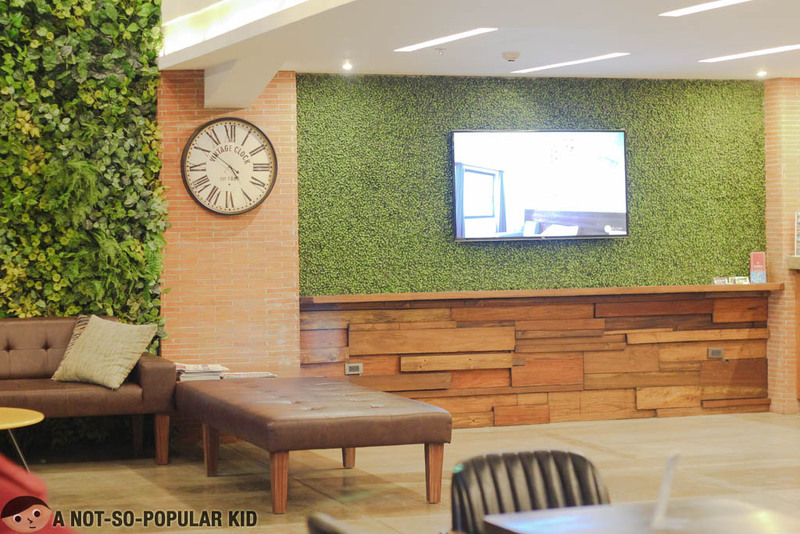 If you want a hip place to chill and enjoy an interesting collection of dishes, drop by U Hotels. 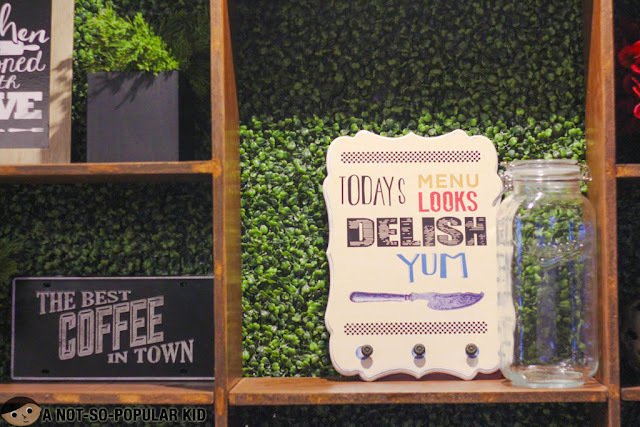 Your palate will definitely taste something new!